Everything happens in a work week. It is basically where the office, company, or factory opens its doors to employees as well as clients. 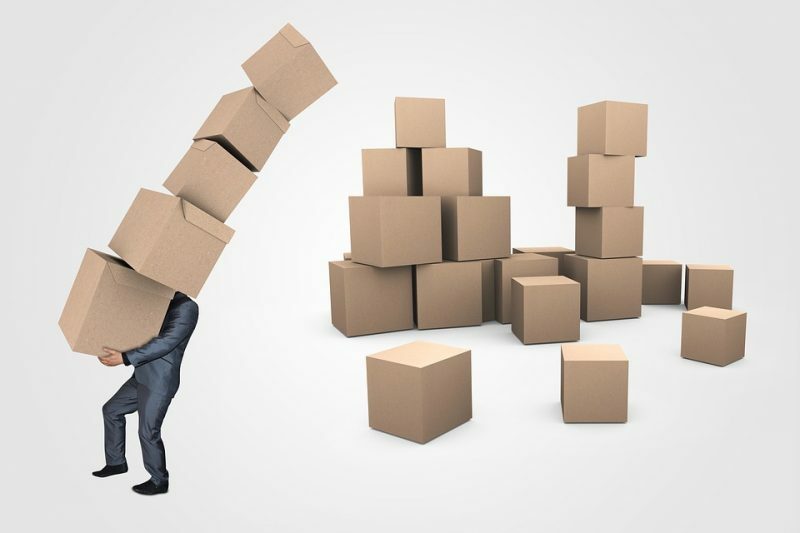 Business operations occur in a work week, from filing and creating reports, producing goods in an assembly line, meeting with potential clients as well as company personnel, delivering goods to other locations, and even constructing a new building. Not all companies approach business operations the same way as they are involved in different industries. For example, business operations for restaurants are very different from business operations in retail clothing stores. Restaurants are basically categorized as food businesses (food industry) while retail clothing stores are categorized as clothing businesses (clothing industry). Restaurants sell food while clothing shops sell clothes so their businesses revolve mainly around their products. The process of creating those products are very different so they involve different operations. So, whatever your company does or what processes you are involved with, all of it is accomplished in the work week. Who Creates a Work Week Policy? Most companies, either a large multi-national corporation or a small enterprise employing three employees have specific persons making the company policies. In larger companies, human resource personnel in collaboration with top management create all the general policies of the company. They craft policies which guide the company in achieving both its short-term and long-term goals. Most of the time, the policies which companies make are more focused on a department level. For example, a sales and marketing policy is created exclusively for the sales and marketing department while a fiscal policy is created for the finance department. But the question now lies on who creates the policies for the personnel under each department? It is the managers and supervisors who formulate the policies for their respective departments, and this includes the work week policies. The line managers, supervisors, team leaders, or the individuals leading each department are ones who are most knowledgeable of the tasks of their personnel. For example, a manager of a graphic design shop delegates work to his different employees, with one employee doing a vintage birthday poster while another employee is working on a rustic wedding invitation. Managers and supervisors are the most experienced individuals in the company as they were previously involved with other company work, thus making them qualified to create the work week policy. How to Write a Work Week Policy? A work week policy is essential for companies to accomplish their weekly goals and tasks. It doesn’t matter if you are the CEO, managing director, human resource manager, or even a rank and file employee, the designation is not important in writing company policies, let alone work week policies. 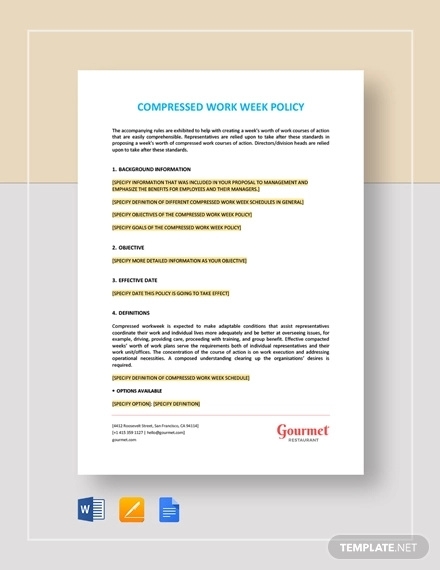 Here are some guidelines to help you write an effective work week policy. Let’s be honest, employees hate reading very lengthy policies. What makes it worse is that sometimes, companies like to conduct meetings or assemblies to discuss the entire contents of the policies, taking away time that was originally intended for work and other work-related activities. Avoid this situation for your company by making the work week policy short and concise. Word of advice though, do this not only for your work week policy but for all your company policies (company-wide policies and department policies). The work week only involves five or seven days, so there is definitely no need to create one very long work week policy. Most likely, the gist of your work week policy should include tasks that need to be accomplished within the work week. 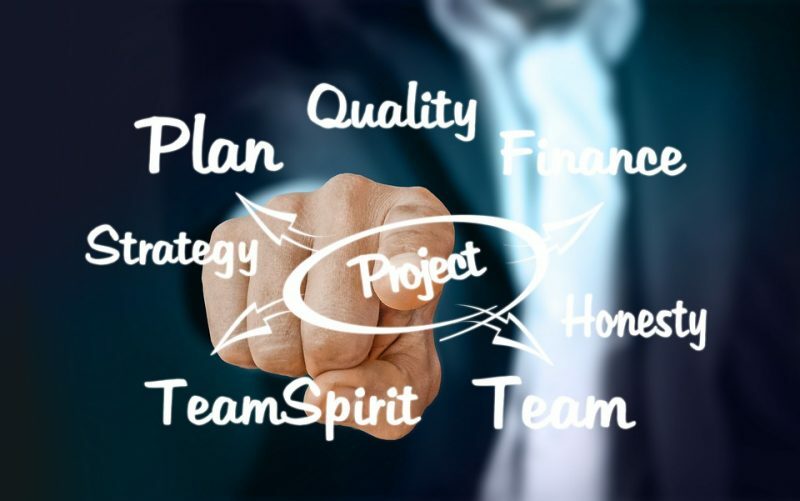 As evident in every business, tasks which are not completed on time will cause headaches not only to the company but also to the to clients and customers. Customers want consistent and quality products, and if they don’t find these two factors in the products they are receiving, they can always go to competitors who are probably selling the same products but having better quality and service. Avoid this scenario for your company and follow the path towards consistency and quality through creating an effective work week policy. As mentioned, keeping your work week policy short and concise will easily get your message across all employees in the company. Short and concise also apply to the effects or consequences that employees have to answer if they do not finish the task on time. Policies are centered on action and reaction. If one task is accomplished, the employee is rewarded. On the other hand, if a task is not accomplished, the employee will have to face necessary actions resulting from the failed task or work. This does not mean that companies should follow an authoritarian or dictatorship rule, where every single mistake of an employee, no matter how small, will result in heavy punishment. For example, one very unreasonable work week policy would be: “If the employee forgets to send an email to his supervisor, a fine of $100 shall be imposed.” You don’t need to add consequences, especially hefty fines and penalties to employees who fail to reach the weekly quota, just inform them of the long-term effect in failing to meet deadlines and tasks not only for the entire company but for themselves, specifically their career. The best way to have a good working relationship with employees is by involving them in decision making. This includes decision making in creating and amending (if necessary) the work week policy. This will ensure that you get input from each and every employee in the company, thus resulting in a policy which will be agreeable by all employees (including management personnel). Policies which are formulated using input from different individuals, not only from a single person or single department, will help the company achieve its goals in a far more effective and efficient manner. We hope you found our article on workweek policies to be informative. We also included information on who should be making the said policies as well tips on how to write these important policies for your own company.